Women’s tennis (10-10) hosted Boston College this Sunday for their senior day, but ended up falling 2-5 to the Eagles. This made for their last home match of the season, leaving them with a 2-8 conference record thus far. The doubles lineup was as usual with senior Sena Suswam and freshman Dina Chaika at No. 1, juniors Raven Neely and Diana Wong at No. 2, and senior Ola Mally and freshman Chloe Hamlin at the No. 3 spot. Mally and Hamlin brought in the first win with a score of 6-4. Next, Suswam and Chaika lost a hard battle, ending at 6-4 to even the score. Unfortunately, the Eagles took the doubles point after winning in the tie-breaker on court two. To kick off singles, No. 3 Neely won her match 6-1, 6-2 to bring the overall score up to 1-1. The Eagles fought back with two wins on court two and five. No. 4 Mally went into a third set to win her match 6-1, 2-6, 6-3 to give the Cards another point. Freshman Dina Chaika went into a third set as well, but fell 6-1, 1-6, 3-6 at the No. 6 spot, clinching the match for Boston College. No. 1 Suswam faced 99th ranked Kylie Wilcox (BC), but their match was left unfinished. She split sets and was up 3-2 in the third. 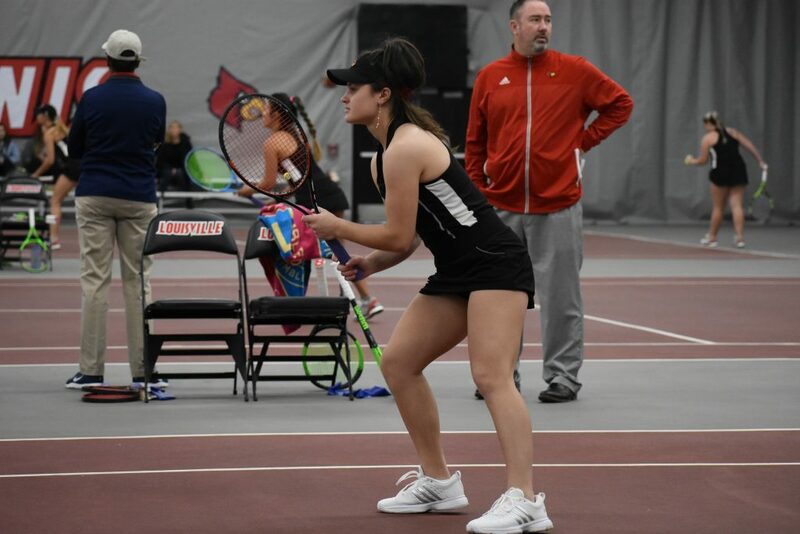 The Cards travel to play Virginia Tech Friday, April 5 at 3pm at the Burrows-Burleson Tennis Center.